For Team-Up Thursday this week, we chose indulge. Cara's image is so sweet and innocent and well mine is um... more adult. I actually took photos of some dark chocolate too, but they didn't come out the way I wanted them too. I think my original idea would have matched up better with her photo, but that's ok. I do love that both of of our shots are of cold things. Especially since it has been very HOT here. Indulge in more great photos here. I don't drink, and I don't have any idea what kind of drink that is, but it looks yummy! LOL! :) Love this theme and love the adult/kid aspects on both ends. tee hee..fun theme. I am more of an ice cream kind of gal, but the set up of your shot is perfect. well done. this is making me want something "indulgent" just looking at it:). great theme. you can send some of your warm weather our way -- oregon hasn't received the message that it's june:(. Yes PLEASE! I just tucked the girl into bed, the house is quiet - time for some indulgence. ;o) An awesome shot all the way around, Jen! 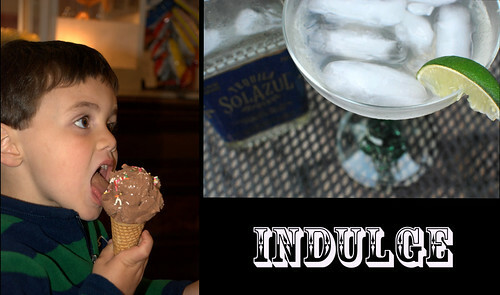 I love that one is a kid indulging and one is an adult indulging. Nice pair. And I could certainly use a margarita right now. Boy did I have a whiney kid today. I did a margarita shot a few weeks back but I like yours more :) Great week! I think both of those look like simply fantastic ways to indulge...YUM!